In 2013, more than 300,000 books were published in the United States, most of which are now lining the shelves of homes, bookstores, online retail centers, and warehouses. Some of the titles released hit the top of the sales charts and most did not. Still, many were the realization of a goal by the author to leave his or her literary footprint in the world. Beyond those hundreds of thousands of books released every year, there still exist the most interesting tales of all, those who have yet to be written. So many people have something worthwhile to say and carry the dream of being a published author.. For the average person, however, the process of writing can be intimidating and confusing. 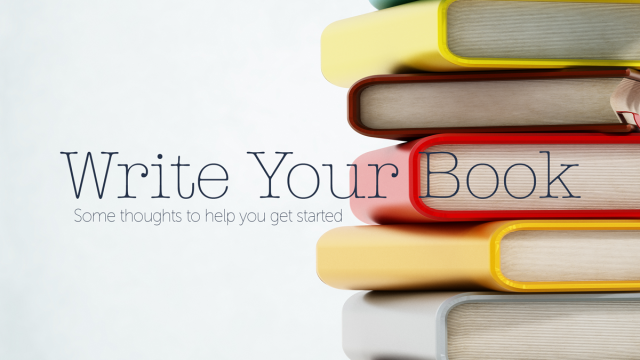 If you want to write a book, where do you start? As director of Communications and editor of the White Wing Messenger, it is my desire to assist potential authors in fulfilling their calling to publish. Through the years, I have been approached for guidance and I have relayed some things I have learned here and as a journalist covering the book industry. What do you want to say? Do you have enough expertise or knowledge in a particular area to carry that idea through a book? a person has enough content for a magazine article while holding onto the hope of publishing a book. Pastors and ministers may already have a head start in this area. recognized pastors are drawn from sermons that began in their home churches. Is there a particular topic that resonated in your church? If so, your book may already be mostly written. It may seem elementary to point out writing as a step toward book publication but this step may get lost in the anxiety over production and publishing. If you have a concept nailed down, most publishing houses will want to see at least an introduction and three chapters’ worth of information before entertaining a pitch to publish your book. An idea is not enough to draw them in. They will want some reassurance you can finish what you started. Many houses will want to see the completed book, even though they will then run it through their editorial department. Editing is a crucial part in getting a book ready for publication. Experienced writers and editors can self-edit to a point, but everyone benefits from another set of eyes that help streamline the points and remove rabbit trails and distractions. Proofing for grammar and spelling is also vital. After a book is complete or as it is being written, the attention will shift to finding a publisher or a means to have it available for readers. This is a common question asked by potential authors and here are a few suggestions and thoughts that may be helpful. Traditional Publishing: The average writer’s idea of publishing is that a major house such as Thomas Nelson or Tyndale will see their work and want to distribute it. There are many success stories to support this dream, but the majority of books by first-time authors will not be published through major houses. On top of that, most publishers will not respond to personal queries. A potential author will need to solicit the help of a literary agent to help pitch his or her book, which is its own journey as well. The publisher or agent will want to know about an author’s platform. They do not view themselves as the sole promoter of the book, but as a partner with the author. An author with his or her own audience will be more likely to find a publishing contract. Manuscript Services: One way to pitch an idea to Christian publishers is through Christian Manuscript Submissions at www.christianmanuscriptsubmissions.com. This is a site built to help aspiring authors reach potential publishers. There is a $98 cost associated with the manuscript submission for every six months the submission is viewable by publishers. The website also offers guidelines in building a book proposal and getting attention from potential publishers. Self-Publishing: When manuscripts are rejected or if an author feels more concerned about preserving their control over the content, self-publishing is an option. While some consider it not as glamorous as traditional publishing, some of the biggest selling books (The Shack by William P. Young, for example) started out this way. When an author self-publishes a book, they are responsible not only for all content, but also for design and layout. They then contract with a printer to print it as a publishing house would. They are the sole investor with a financial stake in its success, but will also receive all the proceeds from the title. The issue then becomes book distribution. With the advent of digital stores such as Amazon, the road to distribution becomes wider. Co-publishing: Co-publishing is similar to self-publishing in that will require an investment from the author; however, some traditional publishing houses use it to partner, offering editorial and design services to create a quality product. Some houses may ask the author to agree to purchase the first 200-500 books at cost in exchange for publishing and distribution. Creation House (Charisma Media), Westbow Press (Thomas Nelson/Zondervan), and Xulon Press (Salem Media Group) are three popular co-publishing divisions authors have called on. Beyond the distribution potential that a co-publisher may offer, there is also the chance that if a book gains enough momentum, a company would offer to move it to its traditional publishing division for a broader shot at the market. Finishing your book is not the end of the journey. It may be only half the battle. During the process of writing and publishing, the author will need to take on another hat as a salesperson. How can the book be promoted? Professional publicists are called upon to help authors and publishers sell books. They seek ways to put the book in front of as many eyes as possible. A traditional publisher will enlist the services as part of its contract, but self-published authors will take on more of the marketing themselves or pay out of pocket for outside help. Authors who want to market their book can turn to social media for promotion, creating Facebook pages, Twitter handles, and blogs containing the book’s content. Self-published authors can set up an e-commerce website such as Square or an Amazon marketplace account to sell books. At the International Offices, White Wing Books offers a spot on its digital platform for promotion and e-book distribution. Don’t give up. Don’t take your book to the grave. There is a book to be written and you can finish it. Not all books are written and published the same way, so if you find yourself facing an obstacle, find a way around it. The message is more important than the method. As a Christian with the truth of the Gospel, the message God has placed in your heart is something that can penetrate the clutter and offer your readers exactly what they need to hear.